The Eastside Harvest House is aiming to be a net-zero energy building. That means that it will generate on site at least 100% of the energy it uses on site. All the energy the homeowners use for heating, hot water, air conditioning, lighting, cooking, fans, pumps, computers—everything—is expected to be 15,500 kWh (kilowatt hours) for a whole year. To generate that much electricity, they need to install a 17 kW (kilowatt) PV (photovoltaic) system. A fixed 1 kW PV array tilted at a near optimum 25 degree angle from the horizontal and facing due south generates about 980 kWh annually in the Seattle area, even with our notoriously cloudy weather. That means we need a 60 foot long by 24 foot tall array. We can’t use the roof of the house or garage because they face the wrong direction, aren’t steep enough, and are too small. 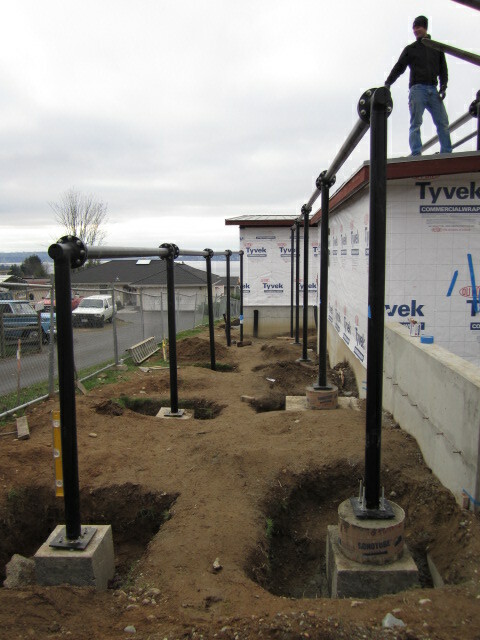 So the solar contractor built a custom rack from steel pipe. It runs over the garage and is partly supported by the garage roof. 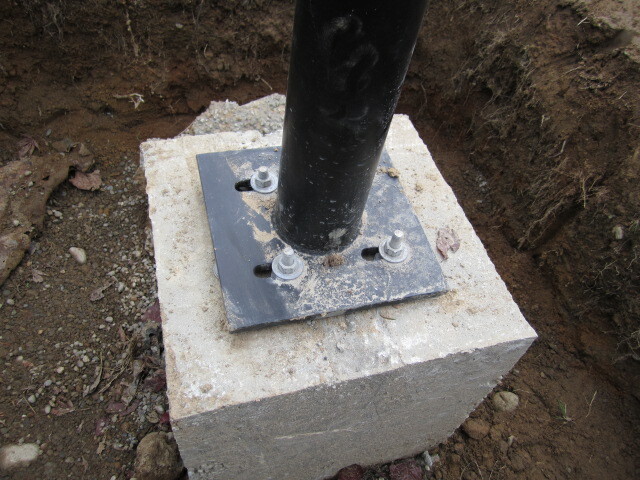 The rest lands on concrete footings on the ground, each at a different height which required precise lengths of pipe. The rack made use of standard pipe fittings to make it relatively easy to weld together in the shop and then assemble with bolts in the field. It is powdercoated black to stand up to the weather and look sleek. A structural engineer made sure it can resist strong winds trying to send the PV panels into the neighbor’s yard.